Incomparable Villa Nestled In An Olive Grove In The Hills Above Florence. This historic estate on the hills surrounding florence dates to the 1200's and was originally the home of Accursio da Bagnolo, famous for having gathered the definitive publication of giustinian law. The present villa was built in 1874 by architect architect Leopoldo Pasqui. Today the villa has been lovingly restored and completely updated by its current owners. The villa sleeps ten comfortably but additional guests can be accommodated through special request. The rooms are all bright and spacious and feature exquisite interiors and flooring. The bathrooms are all large and most with enormous showers and separate bathtubs. The extensive grounds ensure privacy and plentiful options for rest and relaxation. Your stay at Vila Accursio includes preparation and service of two authentic italian meals a day*, as well as daily housekeeping and maid service by our on-premise care takers. *Food & beverage costs are not included. The owners fell in love with Italy when they moved there in 2001. In 2004, they came upon this historic villa which was in a state of disrepair. Over the years they have restored it to its original grandeur, hired a staff to maintain their high standards and extend a high level of hospitality to visiting guests. The picturesque setting and deep history of this property made this a truly unique property. The villa is set on 40 acres of beautiful landscaping, olive groves and vineyards. Our farm provides the villa with fresh eggs, fresh produce and the highest quality olive oil and wine. 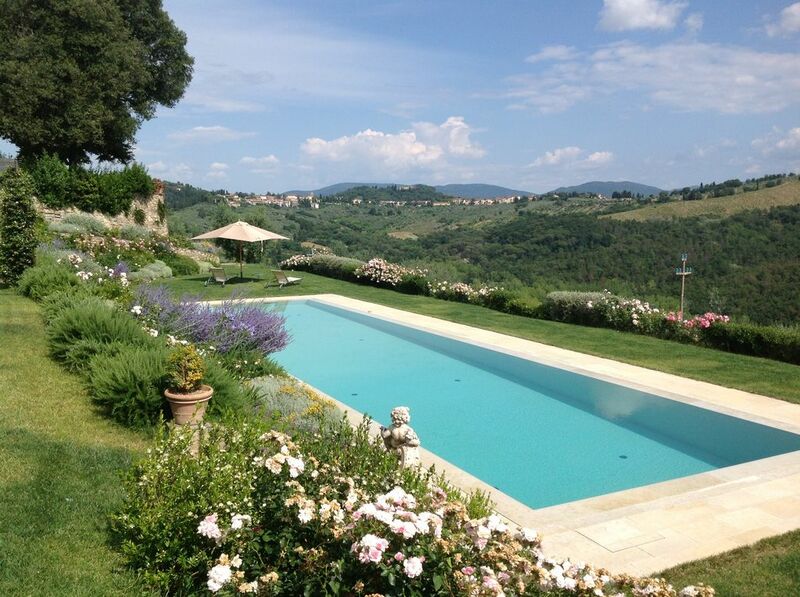 An incomparable villa nestled in an olive grove in the hills above Florence. There is a telephone available for local calls only. Long distance calls must be made on the renter's devices. We have 6 portable air conditioners that can move from room to room. Luxury linens provided on all beds. We have two fireplaces in the living room and one in the kitchen that we use for grilling meat etc. Elliptical, Treadmill, Bench with free weights and more! La Marzocco plumed espresso machine. Dining areas include the kitchen, main dining room and multiple outdoor settings. Every common room has a remote for the stereo and plugs for iPods. A large selection of books as well as travel guides and books for cities in Italy and other European countries. A large selection of board games and toys. The sport court includes tennis, basketball and soccer. Our chef will prepare breakfast and your choice of lunch or dinner, and daily housekeeping services are included with rental. The home is equipped with elevator, telephone, fax, wi-fi internet connection, 2 plasma T.Vs., satellite connection, DVD, stereo, bar, safe, washing machine, dryer, oven, pizza oven, refrigerator, 2 dishwashers, mosquito screens, barbecue, billiard, ping pong, trampoline, and is fully furnished with kitchen equipment and linens. The villa is furnished with antiques. There are frescoes and Impruneta terra cotta floors together with parquet floors. The two living rooms, dining room and wine bar all have large doors giving access to the garden. The third level has wood beam ceilings. The grounds include a garden with al fresco dining, an infinity pool, a pool house with bathroom, changing room, kitchen and outside dining area with pergola, sport court with tennis, soccer, basketball, a trampoline, ample parking, olive groves and a chicken coop. Gorgeous interior, views stunning and great cook! I have traveled throughout Europe over the years and have never stayed in such luxurious accommodations! We loved it so much we stayed twice over two years. Each room is decorated with antiques from 100plus years ago, but the villa has been renovated with all the modern amenities. The manager/cook was fantastic! She helped with transportation inquiries, guides and even an English speaking doctor for a minor problem. The food was delicious and was made per our requests including a couple of cooking lessons! We hiked everyday, explored small nearby towns, toured Florence with a fantastic guide recommended by the villa staff, and drank wine and enjoyed appetizers every night on the expansive pool terrace and patio. We hope to go back to the villa with the whole family!! We stayed at Villa Accursio for my parents 50th wedding anniversary with a group of 13 family members- He had read in previous reviews that the pictures of the villa did not do justice to the beauty of the site and I can confirm that we all felt that this was the case!! The Villa, the grounds, the pool area, the Tennis area, everything is absolutely stunning!! eating dinner al fresco every night was the best and we all much enjoyed Fely’s cooking! The staff at the Villa makes everyone feel very comfortable and they are very discreet... Danny is great picking up groceries and special items at the local store and Edna is also great and helps with the cooking! The bedrooms are large and the beds very comfortable! As the villa is so large and each bedroom has its own bathroom it makes everyone have their area of privacy. Finally, The location of the Villa is great as it is close to everything and makes daily trips very accessible. We all agreed at the end of our week that we could not have chosen a better place to spend that special event as a family together! !Thank you Phyllis and Ted for sharing your special place in Tuscany!! 5 Star Villa in the Heart of Tuscany! Everything about the property is amazing. From the private chef (Felly) to the amazing grounds this Villa is your ultimate Tuscan destination. We spent hours lounging by the pool and eating fantastic traditional italian meals and were only about 15 minute drive to the center of Florence where we could visit all the sites we hoped! Can't wait to come back!! My family and I stayed at the villa in October 2016. After reading the reviews, we had very high hopes for our vacation, the 8 days we stayed at the Villa exceeded all expectations. The villa itself is pearched on the side of a the Tuscan hills in a place so beautiful that it was quite frustrating that we could never quite capture the beauty in any of our pictures. Being inside the villa transports you back in time, as if you were an Italian royal. We all miss Fely the chef the most. She was welcoming, warm and an amazing cook. We would all recommend spending your Tuscan vacation here, words and pictures will never be enough to describe the perfect Tuscan experience we all had. We saw the website for Villa L’Accursio and knew it would be lovely but it greatly exceeded our expectations. The Villa, the amazing Tuscan vistas and our housekeeper/cook Fely and staff were amazing; the Tuscan food was the best! It is better than any five star resort in the world. Our kids and grandkids had the time of their lives with the facilities: huge eternity pool (cleanest one we have ever seen), tennis/basketball court, trampoline, etc. It is ideally located adjacent to the town of Impruneta and a short distance from Florence. For us this was a trip of a lifetime! Situated among vineyards and olive groves above the hills of Florence, Villa Accursio offers an incomparable Italian experience. Food, beverages and gratuities not included in nightly rate. Rates posted are for groups up to 10 people. Please email for rates for 11-16 people.